Spanish poet of the thirteenth century; died at sea in 1259 or 1260. Under the pressure of the Almohade rule he embraced the Mohammedan faith, but it was believed in Spain that he recanted before he died. There exist three editions of his works (Cairo, 1875 and 1885; Beirut, 1885), which were written in Arabic, and were edited by Ḥasan b. Mohammed al-'Aṭṭar, who also appended a biography of the poet, in which he broadly discussed the question of the sincerity of Ibn Sahl's conversion mentioned above. The poems are mostly of a religious character; a specimen may be found in Ḥaji Khalfah's article on the poet (vol. iii. 241, "Diwan," p. 52). 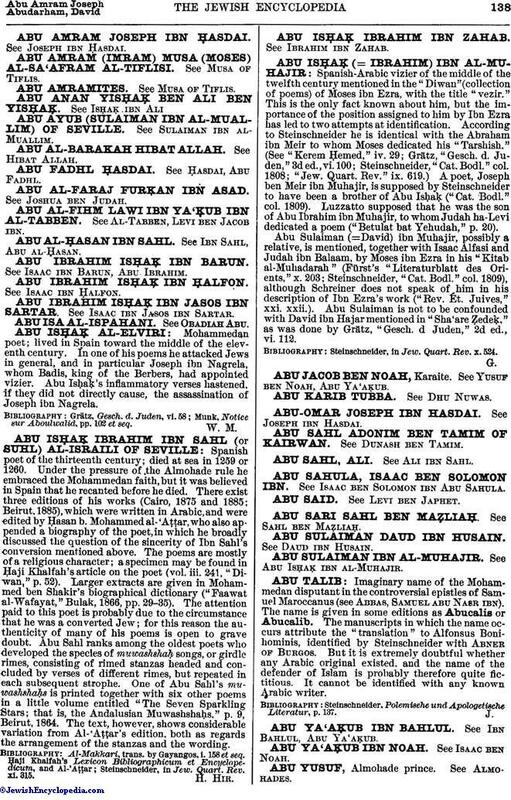 Larger extracts are given in Mohammed ben Shakir's biographical dictionary ("Faawat al-Wafayat," Bulak, 1866, pp. 29-35). The attention paid to this poet is probably due to the circumstance that he was a converted Jew; for this reason the authenticity of many of his poems is open to grave doubt. Abu Sahl ranks among the oldest poets who developed the species of muwashshaḥ songs, or girdle rimes, consisting of rimed stanzas headed and concluded by verses of different rimes, but repeated in each subsequent strophe. One of Abu Sahl's muwashshaḥs is printed together with six other poems in a little volume entitled "The Seven Sparkling Stars; that is, the Andalusian Muwashshaḥs," p. 9, Beirut, 1864. The text, however, shows considerable variation from Al-'Aṭṭar's edition, both as regards the arrangement of the stanzas and the wording. Steinschneider, in Jew. Quart. Rev. xi. 315.